Have you purchased the Petal Card die? Are you wondering what you can do with it now that it is in your home? When I first purchased this die, it was mainly because I was struck by the way it folds and tucks in on itself to form a self closing envelope. Once I had it in my home and in my “studio” it sat on a shelf for a long time because I was not sure what to do with it. I’m not alone in this I’m sure. Purchasing something then wonder why I did that. This die got a lot of use last week while I was snowed in. 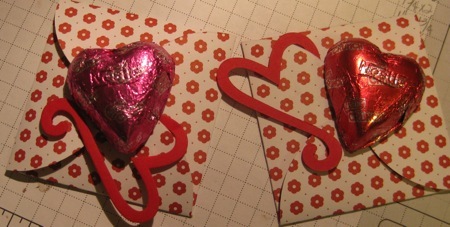 I took advantage of the storm and the threatened power outages to get my Valentine gifts made and sent to my family. 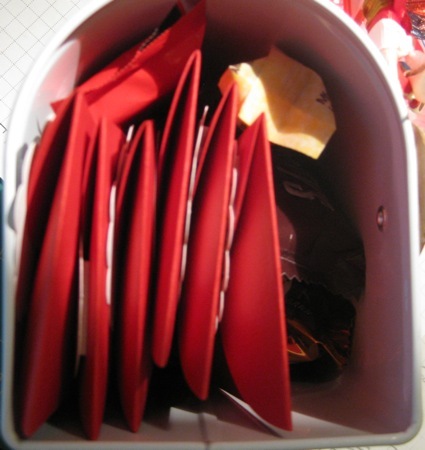 Each child and grandchild got a special note from me delivered in a mail box stuffed with assorted candies. I had so much fun creating these gift boxes and notes. Since I could not get out and around I was forced to concentrate on getting this task completed and in the mail. It is my main focus to let my children and grandchildren know that I love them. It is selfish of me, I know, but in the event of my demise I do not want to be on my deathbed and regretting that I did not tell my family I love them and how special they are to me. My daily life is so full of coming and going and busy doing that I get lost in my world and don’t see past that. Mailbox, candy, and love note. I took the time to think about each person and the things that make me laugh or warm my heart because they are in my life. The cute mail boxes I made will be stuffed away in a closet somewhere or put in a box out of sight. The candy will be consumed. The love note will be lost somewhere in a drawer or box. The message will remain with them for a long time. 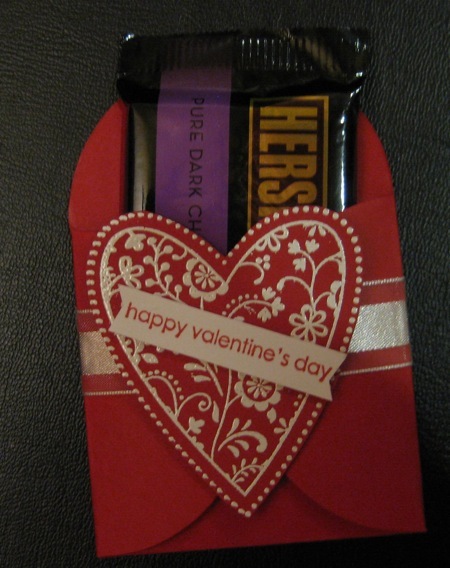 That was the most important part of my Valentine’s gift this year. The Petal Card die I purchased long ago has finally been put to use. It took more time to get the paper laid over the die and ready to be cut out than it did to actually cut the shape. I was so thankful for that die by the time I was finished with the first mail box. Had I needed to cut out 24 of those note holders by hand I would have given up by the second one and none of this would have been accomplished. Yesterday I met with a group of Stampin’ Up! demonstrators. Much to my surprise the discussion was about the Petal Card Die and the many ways to use it. I have no idea who made what but an assortment of items were displayed on a table. You can well imagine my delight when I saw the creativity these women have when I saw what they had come up with. After seeing these creative ideas how can you not be inspired by this single die? What are your needs? Do you belong to a book club? Do you have an avid reader in your family? This Petal Card die makes the creation of a bookmark easy and personalizing it is just as easy. Do you have an event coming up that requires a little something for table seating? 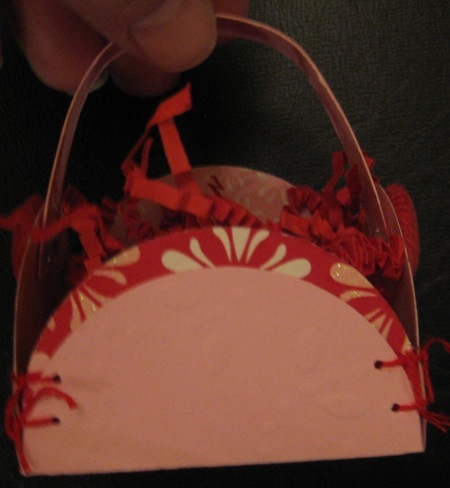 The basket made from this Petal Card die can hold candy hearts, jelly beans, or some nuts. Designer papers used for the theme or color scheme will make these baskets the talk of the neighborhood. Co-workers or your children’s class mates will be delighted to receive a sucker wrapped in a package you made all the more special. Have you made cards the same way for so long that you have run out of ideas for card fronts? Create a hidden message on your next card with the Petal Card die cut just to stir things up. Has this inspired your creativity? Pop on over to my Stampin’ Up! website and place your order for the Petal Card die #113467 today. While you are there add some paper to your order and a rubber stamp. Sale-A-Bration is still going on. You have until March 31, 2010 to take advantage of free stamps, punch, and 6×6 paper with your order of $50. For every $50 you get to choose one item from the Sale-A-Bration catalog. Valentine’s Day is fast approaching. 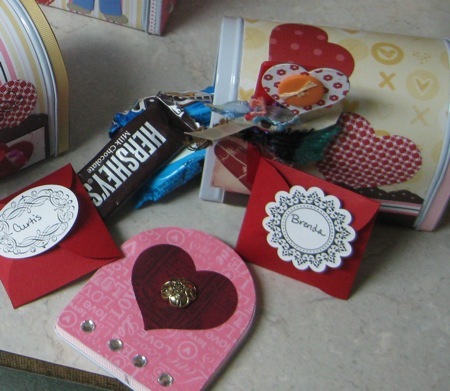 Do you need to have some quick little items to put together for your child’s classmates? Want to make something for your co-workers? 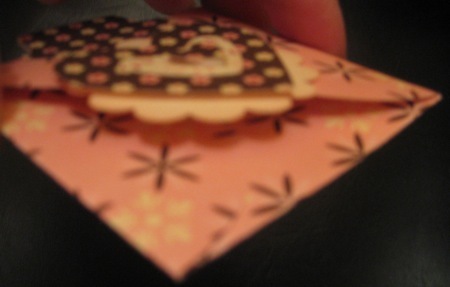 This little card is made with the Petal Card die. Using the Big Shot and Designer Paper the Petal Card die not only cuts the shape out, it also has creases or score marks for the folding areas on the card. No measuring, no rulers, nothing. Just cut it and fold it. 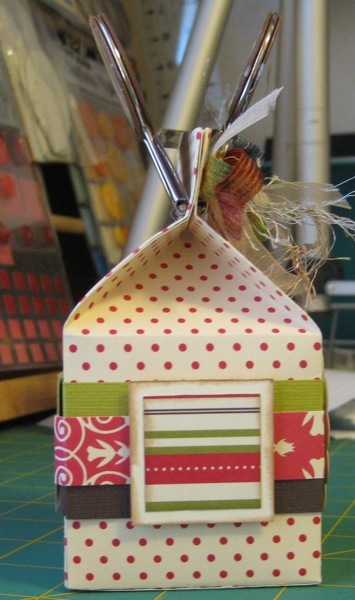 Using double sided Designer Paper makes the outside just as cute as the inside. 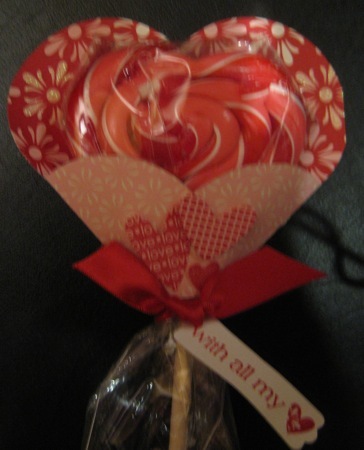 Put a couple of glue dots on the candy treats and attach to the front of this adorable Petal Card and you have a treat with a hidden message. I’ve used a thin die for the scroll heart. 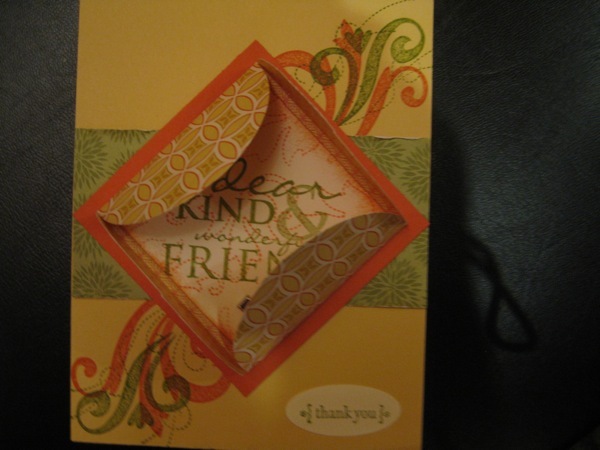 Just tucked the end into one of the flaps of the card and leave it to hang. No gluing or anything it just hangs right there. Today’s video shows using the Petal Card die and the Big Shot. I also give some information about the acrylic cutting pads and what to do when they bow up, which is normal. Nothing to get excited about. The acrylic pads warp during use because of the pressure applied to them with the die beneath. It is not necessary to replace them when they warp and are all marked up. Normally, with a die such as the Petal Card, you can cut through three or four sheets of paper and make the cutting process quicker. Because this die has a score plate for the flaps, it is recommended you do the cutting one at a time. Any more than that and the scored flaps will be cut through. You can’t salvage them then. The process isn’t difficult, a bit tedious on 10 or more, but it is over fairly quickly. I’ve used a 6×6 sheet of Designer Paper for these treat cards and the creases are well defined without being cut and damaged. This die works great for card stock. Same for the card stock, one at a time for best results. About three years ago, while searching the net for something to create I came across Mirkwood Designs and downloaded the pattern for this little box. It sat in my room and was shuffled from one spot to another. Each time I looked at the pattern I told myself that I should try it. When I visited the Stampin’ Up! site, long before I became a demonstrator, I saw one of these boxes there. Stampin’ Up! has a die for this box. It is a Big Shot die and I didn’t have a Big Shot. So…you know how that goes. When I decided to use this weekly format for my videos the first thing I rounded up was this cute box pattern. Am I glad I did. Stampin’ Up! 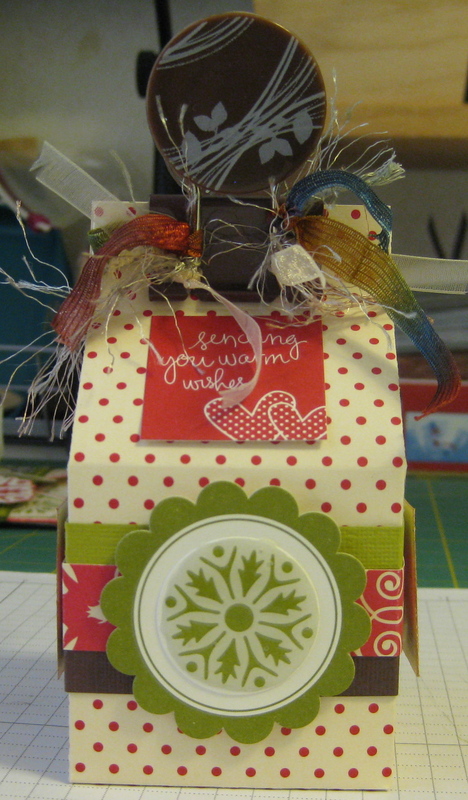 products used in this cutie: Christmas Jingle Simply Scrappin’ kit #115696, Sticky Strip #104294, Stampin’ Dimensionals #104430. That’s it. This awesome box is made from scrap pieces I had left over from the Christmas Jingle set, the epoxy sticker on the front is made from the stickers that come with the set plus Crystal Effects #101055 to make the epoxy sticker, the “Sending You Warm Wishes” sticker is from the Christmas Jingle set. I used some of the 1 inch pieces I had left over from the tag project of the day before. Putting a mat behind the 1 inch piece, measuring 1-1/4 x 1-1/4, and inking the edges of both pieces made the sides look dressed up too. The binder clips I picked up at an office supply store that had a bag of these in the clearance bin for $1.50. I just had to grab those. 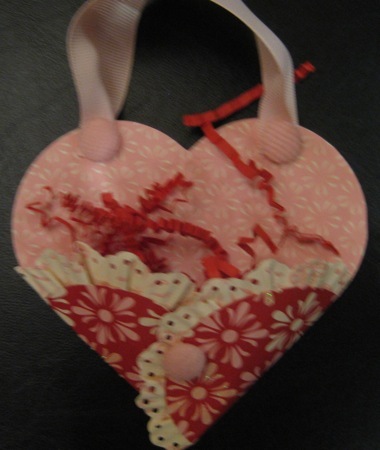 The ribbon is from my stash jar of scrap ribbon pieces. I have a video tutorial for this cute box. You will hear the vacuum sweeper going. My husband, awesome man that he is, got bored and took the task on himself. I’m such a lucky girl!!!! This is the end of the first week of January. Can you believe it? I’ve had fun this week. Hope you have, too.